After a kind spring, Nelson and Marlborough farms were looking good, and those offered to the market had the advantage of excellent presentation. In common with other regions, spring in Tasman featured some high quality rural property listings. These included a 449 hectare Golden Bay property, with a 232 hectare milking platform, producing just short of 260,000 kilograms of milk solids per annum; a 247 hectare coastal Pohara, sheep farm, overlooking Golden Bay; and a 339 hectare Nelson Lakes sheep and beef property. For sale by deadline or tender, these will be closely monitored as their marketing campaigns come to fruition between mid-November and early December. As summer proceeds, particularly with uncertainty around Mycoplasma bovis receding, the dairy property market should become more active. Marlborough viticulture land remains in heavy demand, including development blocks. Several excellent North Canterbury grazing properties were offered for spring sale. These include 1415 hectare Waiau medium hill country station Mt Terako; 574 hectare Oxford dairy support block Eagle Hill; 844 hectare Culverden sheep and beef breeding and finishing farm Mandamus Downs; and a 400 hectare Cheviot irrigated dairy grazing and beef fattening property. Due to the withdrawal of overseas buyers since the government changed the overseas investment regulations, those interested in Canterbury’s dairy sector lack compulsion, and sales have been scarce. This lack of impetus has also affected other market segments. Those considering selling are holding back in the meantime to see how the market responds to the current tranche of listings. With several set for tender, auction or deadline private treaty sales in late November or early December, additional properties could come to the market in the new year. A downgrade in the payout forecast by local co-operative Westland Milk Products provided little encouragement for West Coast farmers, who are also wary of the risk that Mycoplasma bovis will be detected in the region. While a fertile growing season and good productivity are reassuring, these factors did little to stimulate the spring rural property market. Few farmers are offering property for sale, and buyer enquiry is scarce. Repayment of debt is the priority for most West Coast farmers, who are in a prolonged period of consolidation. Consequently, the region’s rural property market is unlikely to change much through summer, with few new listings likely to come forward. As always, the West Coast remains an excellent option for first time dairy farm ownership, and prospective purchasers from other regions would be welcomed into the local market in the summer. Several excellent Mid and South Canterbury rural properties were listed for spring sale. These include a 226 hectare Temuka dairy property; a 385 hectare Mid Canterbury spray irrigated farm with opportunity for arable, lamb finishing and deer; and a 388 hectare South Canterbury sheep and beef farm with resource consent for spray irrigation. However, the market was not especially responsive and progress towards sales is slow. This could change through the summer, particularly around sheep and beef, as the sector’s fundamentals are positive and farmers have every reason to be confident. One factor causing hesitation is tightening environmental regulations. Farmers are realising that regional land and water use plans, and nutrient budgets, are an important factor for anyone purchasing, or financing, a farm, and those who have not paid heed to this in recent years may be penalised when they come to sell. Otago’s spring rural property market was active, particularly in the sheep and beef sector. Lambourne, a 353 hectare Clydevale, South Otago property, changed hands in late October for around $20,000 per hectare, a local record. Several other coastal and South Otago sheep and beef properties also sold as purchasers reacted enthusiastically to some highly-regarded farms. Otago farmers were the buyers in each case. Several more sheep and beef properties are selling by deadline or tender before the end of December. These sales will be closely watched as an indicator of the local market’s strength. A fair balance of supply and demand prevails, with plenty of good stock and interest from willing, wellresourced buyers. 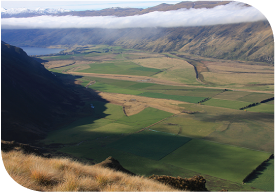 Reayburn, a 295 hectare West Otago property, will test the market for dairy farms with scale. It is selling by tender with a mid-December deadline. Through late winter and early spring, Southland’s rural property market was active. Transactions were almost double the same period last year, including an increase in the sale of arable and dairy support land. Northern Southland featured strong sales of arable land, and large scale dairy units in the district also changed hands during this period. Uncertainty around land values is holding some farmers back, and while intending purchasers await clear market signals, Southland dairy farm listings are likely to take longer to attract buyers. However, an increase in genuine sheep and beef listings, particularly those in sought after localities and with strong production statistics, should attract continuing enthusiasm. With the dollar down, interest rates low, farm returns positive, and the region’s supply-demand balance favouring buyers, the latter should gain sufficient confidence to confirm purchasing decisions as summer unfolds.